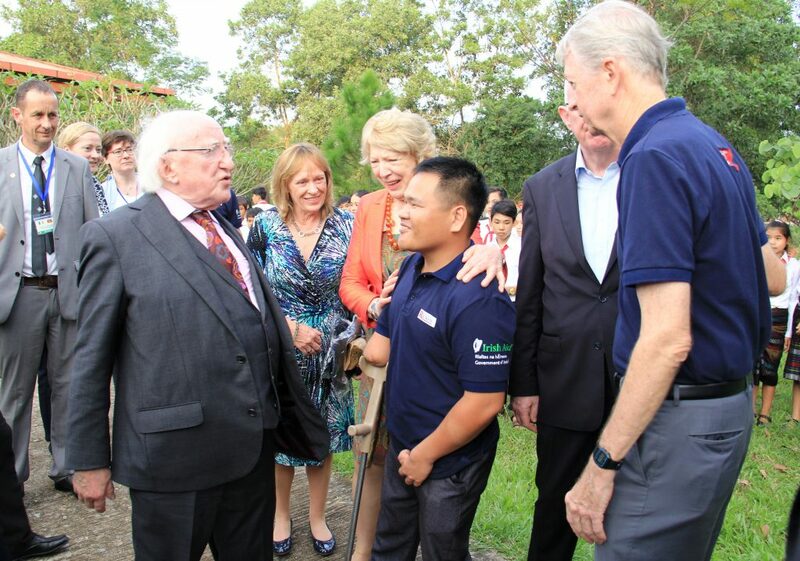 Irish President Michael D. Higgins and First Lady Sabina Higgins meet with Ho Xuan Lai, a victim of a cluster bomb accident in Quang Tri Province which took both of Lai’s legs, one arm, and one eye. 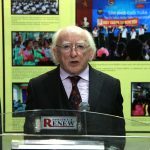 Lai informed President Higgins that he is now working as a Mine Risk Education collaborator with Project RENEW. 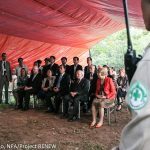 Dong Ha & Gio Linh, Quang Tri (9 Nov 2016) – It was a privilege today for Project RENEW and partner organization Norwegian People’s Aid (NPA) to receive the President of Ireland, Mr. Michael D. Higgins, and First Lady Ms. Sabina Higgins during their visit to Quang Tri Province. 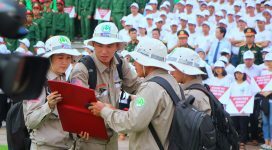 Once heavily devastated during wartime and still facing a daily threat from post-war UXO, Quang Tri was the first province in Viet Nam to receive international assistance for humanitarian mine action in 1996. 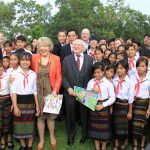 President Higgins and the accompanying delegation from the government of Ireland have been in Viet Nam since 5 Nov on Ireland’s first State Visit to Viet Nam since diplomatic relations were established 20 years ago. 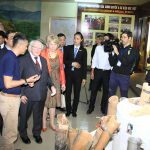 Upon arrival in Dong Ha City, President Higgins toured the Mine Action Visitor Center operated by Project RENEW. 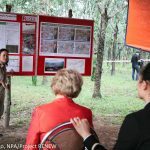 The President was briefed on the deadly consequences of the Vietnam War and current efforts of the government, military and international NGOs to make the province safe from unexploded ordnance. 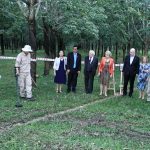 Support from the governments of the U.S., Norway, Germany, United Kingdom, and Ireland through mine action organizations like SODI, MAG, NPA, Project RENEW and PTVN has resulted in more than 600,000 items of UXO being found and safely removed since 1996. 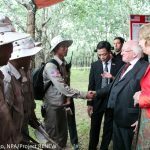 The President met with ethnic minority schoolchildren from Huc Commune of Huong Hoa District who were attending a RENEW UXO risk education session with funding from Irish Aid. 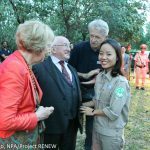 President Higgins said he was pleased to meet again a cluster bomb survivor, Pham Quy Thi, who was in Ireland in 2008 to attend the Dublin Diplomatic Conference on Cluster Munitions. President Higgins noted that he was not only at that international conference, but he had helped to organize it. 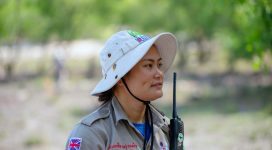 So far, RENEW/NPA teams have found and safely destroyed 50,364 items of cluster munitions and other UXO. More than 56 million square meters of land have been confirmed as hazardous areas which are being cleaned up by MAG teams. 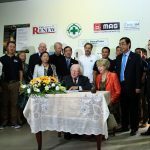 Project RENEW would like to extend our sincerest thanks to President Higgins, the government of Ireland, Irish Aid, and the Irish Embassy in Vietnam for Ireland’s very important support to humanitarian mine action in Quang Tri Province. 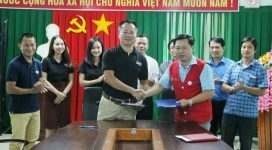 We are convinced that by working together, we can make Quang Tri safe in the near future.